by Andy Higgs in Denmark, Europe, Features, Home. As much as we love Copenhagen (and we love it a lot) we’d be the first to admit that one problem is the weather. Winter is just rotten without the real snow and opportunities to enjoy it and while the summer is wonderful it just doesn’t last long enough – so make sure you enjoy every day of sunshine to the max. Sorry. Anyway, do as the locals do and squeeze as much value as possible out of those warm days. We covered a few outdoor attractions in other posts: you should definitely try swimming at Havnebadet Islands Brygge and Tivoli is a given (although it’s cool in the rain too). 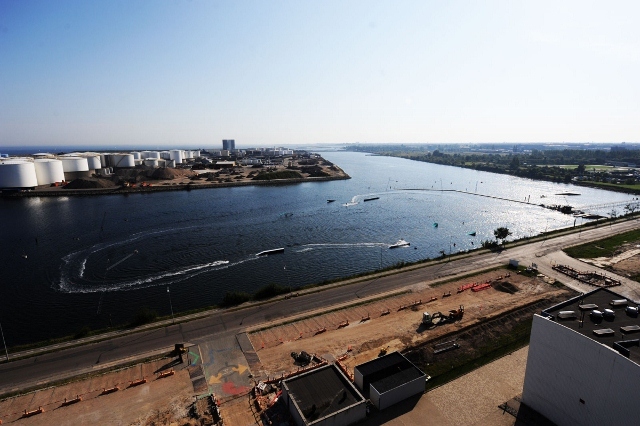 Get a unique view of the city from a kayak tour, and take a break at the rooftop terrace of Café Hovedtelegrafen. It’s also well worth making the trip out to have a look at the kitchy giant beer bottle and the modern architecture of 8-tallet. Sunny days are also ideal for a day trip, and we’ve provided 6 suggestions for trips out of Copenhagen here. 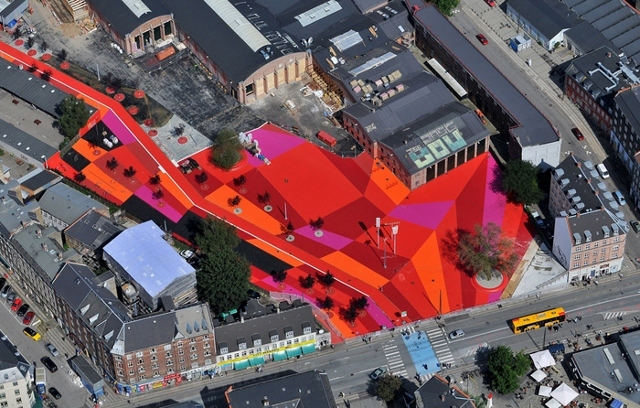 Red Square is part of the urban park ‘Superkilen’ which also has green and black areas, but they’re not as much fun. If Red Square doesn’t involve enough adrenaline for you, maybe wakeboarding is the answer? Now normally this sport involves riding a wakeboard while being dragged by a speedboat à la water skiing; but in Copenhagen harbour you can try cable wakeboarding. This means that you are pulled by an overhead ‘cableski’ system. It sounds a little crazy and it is, but if you can master it you’re in for some real thrills. The majority of people we saw didn’t make it further than a few metres but every now and again an expert showed us how it was done. More passive visitors can watch the fun from the cafe with a beer (sounds better) and soak up the sun if you’re lucky with the weather – they also arrange beach parties which are reason enough to come out here. For one of Copenhagen’s oddest fast-food experiences, join the mixed crowd of anoraks, plane spotters and the relatively normal at the far end of Amagerbrogade. On fine days the place will be packed with people united by a fascination with all things plane-related. The Airplane Grill’s primary selling point is its location slap bang next to the main runways of the very busy Copenhagen Airport. The first time you visit and a plane comes over you’ll be surprised how close they feel. You can also observe real ‘spotters’ in their natural environment scribbling furiously in their notebooks. Yes, these people do exist. Don’t come here expecting a gourmet experience – it’s basic burgers, hot dogs and ice cream but of course being Denmark you can get a beer too. There’s only space inside for about 20 guests but the large outdoor area is the whole point anyway. 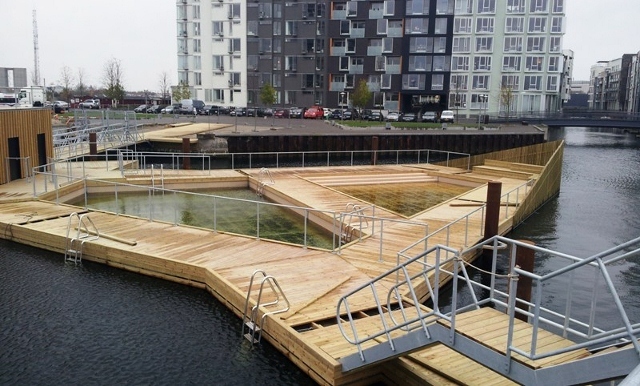 Copenhagen now has three harbor baths to choose from with the recent opening of Koralbadet joining the hugely popular Islands Brygge and Fisketorvet. The opportunity to swim in clean harbour water right in the centre of the city is the envy of most visitors; not many capitals around the world can compete in this regard. Have you tried any of these suggestions? 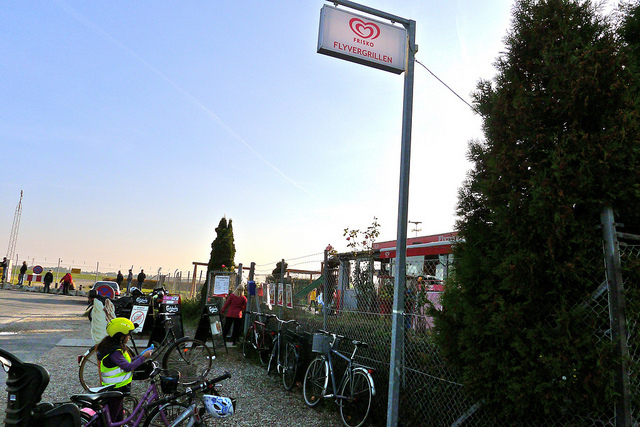 Do you have other ideas for outdoor activities in Copenhagen? Do let us know by adding a comment below and don’t forget to sign up for email updates so that you never miss an article on Grown-up Travel Guide! Hi Andy – your concept to provide a platform for grown-up-travels sounds very interesting. Please email me regarding coverage of services.